Legendary adventures call for Legendary weapons! From mystical blades wreathed in eldritch energies to staves imbued with the wisdom of ancient ages, mighty magical weapons are the calling cards of great heroes. In that spirit, all nine classes can seek out their own Legendary weapons in Kobolds & Catacombs! To start you on your quest, you’ll be granted one random Legendary weapon for FREE just for logging in after Kobolds & Catacombs is released. Each Legendary weapon has its own flavor and unique power. While every class will be able to equip a weapon, those weapons will reflect the character of the classes that wield them. For example, the classes most known for spell-flinging in Hearthstone—Mage, Warlock, and Priest—each have weapons with 0 attack. They’re potent magical artifacts that grant vast powers, but they’re not meant to be swung in combat. 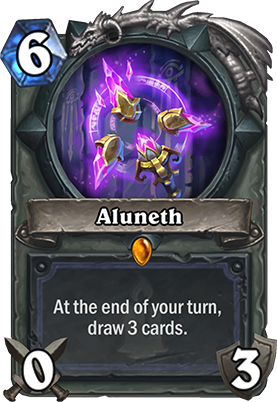 Once wielded by Aegwynn, the last true Guardian of Tirisfal and mother of Medivh, the Mage Legendary weapon is the staff Aluneth. An inexhaustible fountain of dangerous arcane knowledge, it empowers a Mage to quickly draw key cards in the late game . . . at the cost of drawing what remains of their deck with perilous speed. More legendary weapons remain undiscovered in the catacombs! Their secrets will be revealed as we draw nearer to release. Delving into dungeons can be a quick and dirty business. When a monster is breathing down your neck, sometimes you need make use of the items you find almost as soon as you’ve found them. That’s where Unidentified items come in. Do you dare take a sip of that mysterious glowing potion? What effects might it have? Every time you draw your Unidentified Elixir, it has the potential to turn into one of four potions that add their abilities to the base text on the card! There are two more Unidentified items waiting to be discovered in Kobolds & Catacombs. You’ll have some idea regarding what each one is capable of when you add them to your deck, but you’ll have a variety of interesting (and powerful!) side effects to look forward to whenever you draw them! 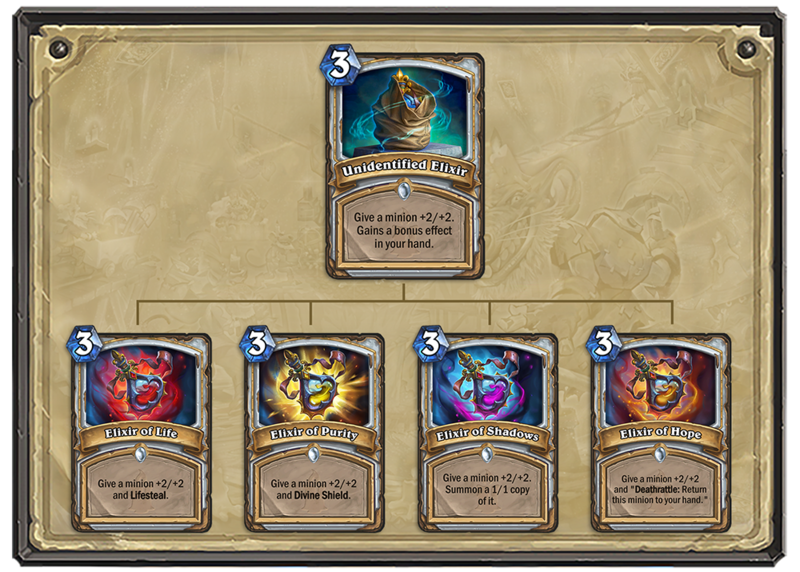 One type of Spellstone was created for each of the nine classes. Heroes that add Spellstones to their deck can awaken them from their slumber, though each one has a unique key – they might be empowered by gaining armor, or casting spells, or Overloading mana crystals. In its dormant state, the Sapphire Spellstone copies a friendly minion for 7 mana. But after its wielder fully empowers the stone, it can be combined with a huge minion to summon a powerful army in an instant! You’ve only taken your very first steps into the winding tunnels of Kobolds & Catacombs. An adrenaline-pumping adventure of tremendous treasures, prodigious perils, and a cornucopia of candle-loving kobolds awaits! Stay tuned in the coming weeks as more Kobolds & Catacombs cards are revealed, when we’ll unveil more about the loot that awaits within those forgotten depths. 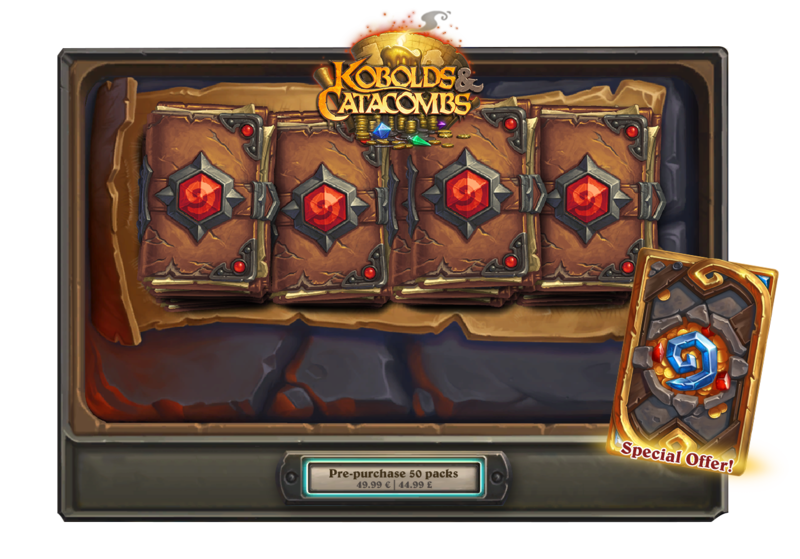 Prepare for your own run through the dungeons of Kobolds & Catacombs. Follow us on Twitter for the latest dungeon discoveries. Visit KoboldsAndCatacombs.com and Facebook for a gallery of cards revealed thus far.